What Are The Best Online Graphic Design Program? What Will I Learn in an Online Graphic Design Program? What Can I Do With an Associate Degree in Graphic Design? If you are interested in communicating ideas through images and creative text, you may want to consider a career in graphic design. From advertisements in magazine pages to eye-catching television commercials, graphic designers employ artistry and technical skills to create memorable multimedia content. To become a graphic designer, a good place to start is earning an online graphic design associate degree. According to the U.S. Bureau of Labor Statistics (BLS), careers in graphic design will remain steady through 2024, but employment of graphic designers in computer systems design is expected to grow 21% in that same period. Read on to learn more about earning an associate degree that can propel you into the creative and dynamic field of graphic design. Foothill College is nationally recognized for academic excellence, innovation, and empowering students to achieve their goals. Foothill offers 15 online associate degrees, including a graphic & interactive design program. Students learn how to understand the design process from sketching to final product, and are able to create their own unique graphic designs by the end of the program. This online associate degree in graphic design includes 90 units of coursework, including 58 units of core and support courses. The curriculum combines general education requirements with essential visual arts skills in layout, design, and drawing. Distance learners have access to a variety of student services, including an online orientation, live video counseling, and tutoring. Freshman applicants must have a high school diploma or equivalent to be considered. Transfer students must take assessment tests in Math and English or submit proof of previous college course completion. The New School offers an associate degree in graphic design online that prepares students to create their own designs using industry-leading software and other digital tools. Graduates with a graphic design associate degree are prepared to pursue a wide variety of entry-level graphic design careers. While most courses in this 65-credit program can be completed asynchronously online, there are some on-campus requirements. Asynchronous courses allow students the flexibility to complete coursework at their own pace. The curriculum is best suited for students who have some college experience or those who have already earned a bachelor's or other advanced degree. Students typically complete the program in up to four semesters, depending on how many transfer credits they have. Transfer students may apply up to 31 credits of coursework towards their degree. Applicants must have graduates from high school at least two years prior to admission. The school evaluates applicants based on their maturity, motivation to learn, and growth potential. GTC offers a two-year online graphic design associate degree that is ideal for students with an artistic flair and technical expertise who want to pursue a career in graphic design. The curriculum provides students with a solid foundation in design, illustration, reproductive concepts, and computer graphic skills. Throughout the program, students create traditional and electronic portfolios to showcase their work to prospective employers. Students can enroll in classes on-campus, entirely online, or in a hybrid format. Online coursework can be accessed through Blackboard. To graduate from this 60-credit graphic design associate degree online program, students must maintain a minimum 2.0 GPA throughout the program. Applicants must complete reading, writing, and math skills placement assessments and submit official high school, GED, or HSED transcripts to be considered. GTC is accredited by the Higher Learning Commission. SBVC is a regional leader in career and technical education, offering a full range of degrees and certificates in some of today's most in-demand fields. The school offers an online graphic design associate degree that prepares students for careers as graphic artists, web designers, animators, and more. SBVC's graphic design associate degree provides busy professionals with the flexibility to complete coursework either online or in hybrid classes. This 60-unit program includes 36 units of general education requirements and 24 units of required and recommended graphic design courses. Major coursework covers a variety of topics, including the history of modern art, two-dimensional design, and digital photography. This program can be completed in two years of full-time study, or four or five years of part-time study. Applicants must complete an online application, an online orientation, and a basic skills assessment test to be considered. SBVC is accredited by the Western Association of Schools and Colleges. CCV offers an online graphic design associate degree that is ideal for individuals who want to leverage their creativity into a career in graphic design. The program offers a focus area in graphic design for students interested in technical design and production. Graduates are prepared to pursue entry-level positions in the graphic design industry or continue their education in a bachelor's program at a four-year school. This 60-credit fully online program teaches students the fundamentals of design and sharpens their skills in multimedia technology. They learn technical skills in drawing and composition and how to effectively use artistic tools and software. As part of their coursework, students create a professional portfolio to showcase their work to potential employers. CCV is an open admissions college and offers classes during the fall, spring, and summer semesters. Transfer applicants must submit an online application, official transcripts, and complete a skills assessment to be considered. CCV is accredited by the New England Association of Schools and Colleges. Typography: Required in almost every graphic design associate degree, this course teaches the fundamentals of typography, or the arrangement of type. This includes the study of technology, theory, and practice. Once students learn the basics of typography, they will often use it to solve a specific design problem. Web Design: This course is required in many programs since graphic design graduates often work as web designers. Students will learn the fundamentals of HTML and CSS in order to design or customize user-friendly websites. Digital Tools: This class is essential for graphic designers since they need to be highly proficient in software platforms like Adobe Creative Suite, which includes Photoshop, Illustrator, Premiere Pro, and InDesign. The class may also teach more specialized skills in programs like Flash, which is used for animation. History of Graphic Design: Sometimes taught as an art history course, the history of graphic design introduces students to the art of design, technical innovations, and important designers who have contributed to the field. Portfolio: This course will teach students to assemble a resume and an accompanying portfolio of completed projects that can be used when applying for jobs or as preparation for a bachelor's degree. Most jobs related to graphic design, including web and multimedia design, require the submission of a portfolio. Graphic design associate degrees give you the technical know-how to be successful in a competitive job market. Some of the most popular jobs in the field right now are related to web design and the production of multimedia content. A graphic designer's combination of technical and artistic skills can also lead to careers in fine arts, animation, and advertising. Those employed at commercial firms will generally work in design teams in traditional offices outfitted with studio equipment. Designers working in these settings are usually salaried employees, but many designers are self-employed. According to BLS, in 2014 about half of all multimedia artists were self-employed, and one in seven web designers were self-employed. Self-employed individuals should be prepared to work from home, and should also be prepared to work nights and weekends if a client has a tight deadline. Graphic designers are responsible for visually communicating ideas across a variety of multimedia platforms, and may design advertisements, magazines, and promotional materials. According to BLS, one in five graphic designers was self-employed in 2014. Web designers are responsible for the look of a website, but also need to know the ins and outs of a website's architecture. Because of this, web designers should be proficient in both computer programming and graphic design. Working in fields such as motion media design, television, and video games, these artists create animations and visual effects. Multimedia artists need both technical and graphic design skills, and should have a strong portfolio of work. 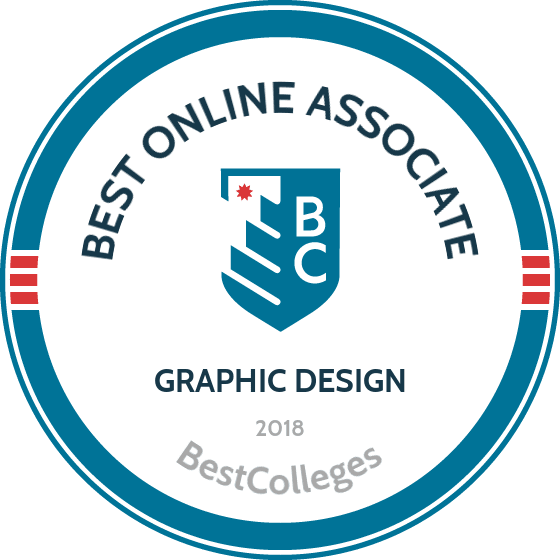 Students with an online graphic design associate degree can transfer into bachelor's-level programs in graphic design, web design, animation, or visual communication. According to BLS, many job candidates for graphic design jobs have bachelor's degrees and will need to demonstrate their skills with a strong portfolio of work. Transferring into bachelor's degree programs will allow students to expand their portfolio while giving them a competitive edge once they hit the job market. Bachelor of Fine Arts in Graphic Design: The main difference between a bachelor of fine arts degree and a bachelor of arts is the ratio of courses. BFA degrees involve more major and art-related courses, while BA degrees include more liberal arts classes. Because credit requirements vary, not all associate degree courses transfer into a BFA as easily as a BA. Bachelor of Arts in Animation: This degree is all about the art of motion, its history, and its practical applications. Students with an associate degree in graphic design generally have the art background and technical experience necessary to transfer into an animation program. Bachelor of Science in Web Design/Development: Graphic designers transferring into web development programs will enhance their knowledge of web standards, advanced programming concepts, and applications. According to BLS, employment of web developers is expected to grow 27% from 2014 to 2024, which is much faster than average. Bachelor of Arts in Visual Communications: Visual communications is a general term used to describe how design impacts the presentation of information and ideas. Due to the overlap between graphic design and visual communication, students may find it easy to transfer credits from an online associate degree in graphic design. According to BLS, the median annual salary for graphic designers was $47,640 in May of 2016. However, salaries vary greatly, with the lowest 10% earning less than $27,950 and the highest 10% earning over $82,020. Salaries also vary based on industry, with graphic designers employed in computer systems design earning almost $17,000 more per year than those employed in printing and related services. Online graphic design associate degree programs generally have a number of funding options available to students, including merit and need-based scholarships, loans, and federal financial aid. Students should complete the Free Application for Federal Student Aid (FAFSA) to qualify for financial aid and federal work-study programs. The FAFSA may also be required by schools in order to be considered for need-based scholarships.